Leading ferry company Stena Line has achieved another major milestone in its fleet investment program with the ‘float out' ceremony of the second vessel in its new generation E-Flexer series. The second vessel will be named Stena Edda* and follows the Scandinavian heritage decided for the five new vessels that are being constructed at the Avic Weihai Shipyard in China. Stena Edda is scheduled to enter service on the Belfast-Liverpool route in spring 2020. This is the second of three new E-Flexer vessels bound for the Irish Sea during 2020 and 2021 and represents a significant multi-million investment by Stena Line in the region. 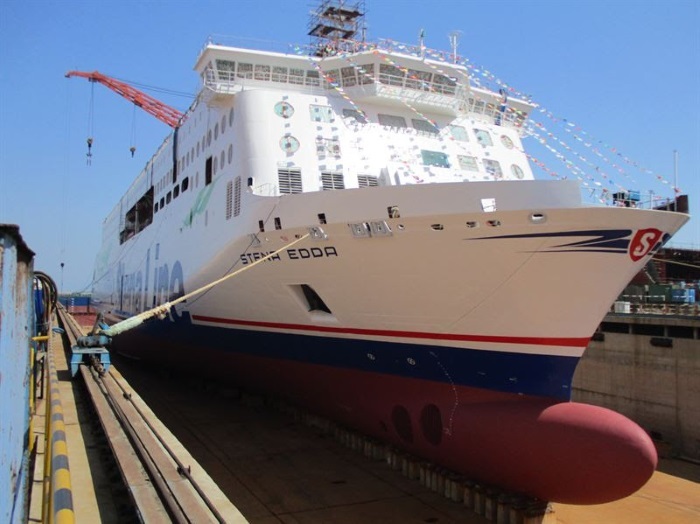 The ‘float out' ceremony started at 13.18 hrs local Weihai time today and at 18.00 Stena Edda floated out of the dock. These timings were chosen especially because 18 is a number of good fortune in China. Stena Edda just before the water started to fill up the dry dock. At 215 metres, all three vessels being built for the Irish Sea will be larger than today's standard RoPax vessels and will provide freight capacity of 3,100 lane meters and the space to carry 120 cars and 1,000 passengers and crew. For Belfast – Liverpool capacity will increase by almost 20% compared to today. The next generation vessel is also well in line with the Stena Line strategic commitment to Sustainability and will be extremely fuel efficient to reduce emissions. They will also feature a digitally enhanced customer experience. “Stena Edda will deliver many benefits to our freight and travel customers including faster and easier loading/unloading with drive through decks and new port infrastructures. Our latest design in cabins and further enhancement of our Scandinavian inspired interiors will make these new ships the largest, most spacious and most comfortable ships ever to sail between Belfast and Liverpool,” said Paul Grant, Stena Line's Trade Director, Irish Sea North. In addition to the three Irish Sea bound E-Flexer vessels, Stena Line has also ordered a further two E-Flexer RoPax vessels with a larger design, to be deployed within Stena Line's network in 2022. These larger ships will be 240 meters long with a total freight capacity of 3,600 lane meters, and passenger capacity of 1,200. Stena Lines sister company Stena RoRo is managing all the E-Flexer building projects that are ongoing on Avic Weihai Shipyard.